It looks like a truck, but it's really a muscle car... and it growls. My truck is a 1998 Jeep Grand Cherokee 5.9 Limited. I didn't know when I bought it that it was a rare truck. I was fascinated by it on the first test drive in 2009 after moving to the Bay area from Washington State. 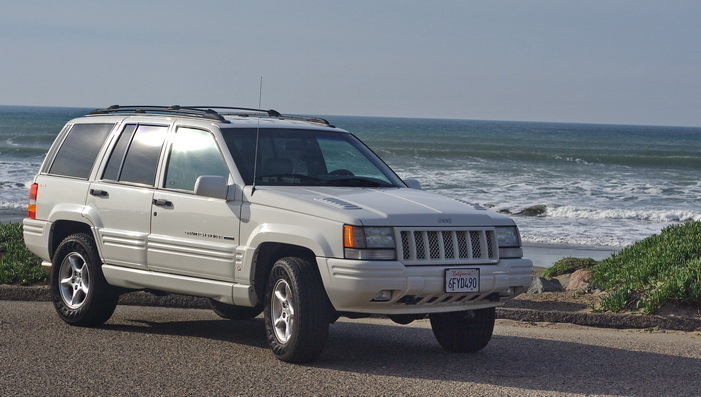 The 5.9 Limited was a Jeep Grand Cherokee produced only for the 1998 model year, having more luxury and performance than that of the regular Limited. Chrysler manufactured nearly a quarter million Grand Cherokees in 1998. Of those, less than fifteen thousand were 5.9s. It housed a Magnum 5.9 LV8 engine with an output of 245 hp (183 kW) and 345 lb·ft (468 N·m) of torque, going from zero to 60 mph (100 km/h)in only 7.3 seconds (Motor Trend measured this at a slightly faster 6.8 seconds), making it the quickest SUV available that year. The performance of the 1998 5.9 L V8 has been surpassed by Jeep only with the introduction of the 2006 Jeep Grand Cherokee SRT8, which housed a 6.1 L Hemi Motor. The 5.9 Jeep Grand Cherokee was named the 1998 four-wheel drive vehicle of the year by Peterson's 4-wheel & Off-Road. My truck is one of the 10,051 that were produced that met Federal Emissions Standards. Even though the California emissions models are more rare, they aren't as desirable as the Federal emission versions have less restrictive emissions controls. In the 5.9L V-8 engine (Grand Cherokee, Dakota and Ram pick-up, and Ram van), a new camshaft adds up to 15 bhp and the torque curve is widened to provide more responsive performance in the normal driving range for all models. In addition, specific to the Grand Cherokee, 15 degrees more spark advance (which requires premium fuel) and a 25 percent reduction in backpressure makes a total increase of 25 bhp over the current 5.2L engine. The cooling fan motor is now electric, eliminating a power drain of up to 20 bhp. * 0-50 - 4.90 sec. * 0-60 - 6.80 sec. * 0-70 - 9.20 sec. * 60-0 Braking - 126.00 ft.
* 1/4 Mile - 15.20 sec. Big props to Craig Hill and his crew at Top of the Hill Performance Center http://topofthehillpc.com/ who straightened out the botched exhaust install from another shop and installed the headers for me. Fantastic professional job.